Hungarian interior designer, living and working in Paris . Cours de la Civilisation Française – Sorbonne Paris 1992. Diplôme of Marketing et Publicité – KOTK Budapest 1994. Diplôme of Interior and Furniture Design – GRETA des Arts Appliqués Ecole Boulle Paris 1998. Certificate of competence – CFAI 2003. After many years of collaboration with designers and architects, as Didier Gomez at Agence ORY-GOMEZ, Philippe Starck at Agence STARCK, Claudio Colucci at CCD and Axel Schoenert at AS architectes, Zsofia opened her own interior design office in April 2014 in Paris. She takes great interest that each project has his own identity with a special personal touch, combining the Client’s wishes and spaces she creates. Zsofia likes to play with formes, colors and materials to create unique and harmonious atmosphères. She has a passion for détails, and takes great care of finishes and the choice of materials to highlight the quality and the comfort in her interior and furniture design projects. Inspired by everything, Zsofia likes to amaze and surprise. Animated by a great curiosity, she’s permanently looking for hot picks and novelties : materials, products technologies, and inventions. 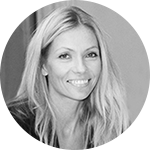 In listening to her Clients, Zsofia always puts forward their wishes and their satisfaction.